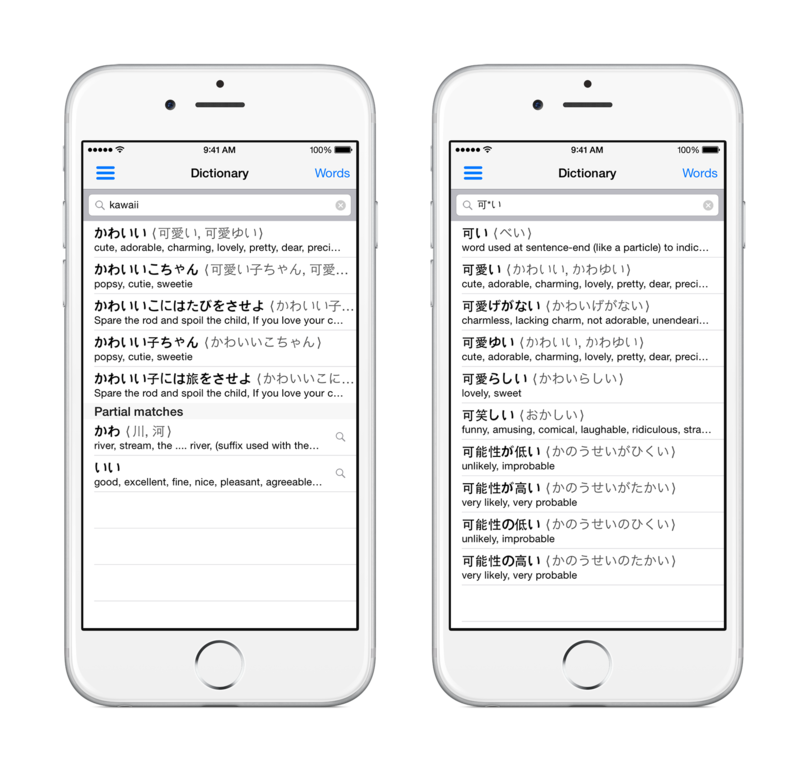 • Over 170.000 dictionary entries with readings and english meaning, over 6.500 kanji characters with stroke order, over 730.000 Japanese names, place names and institution names. 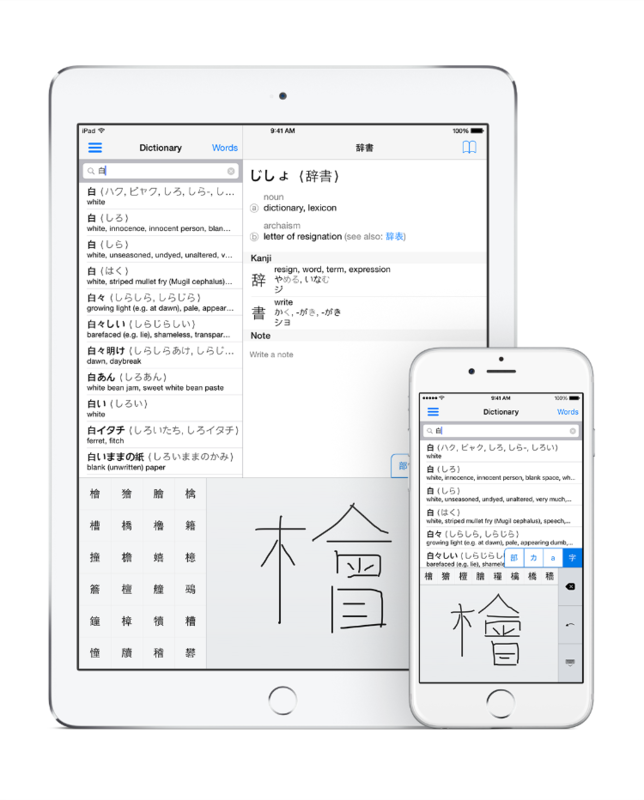 App offers robust handwriting recognition, which can handle wrong stroke order and minor writing mistakes. 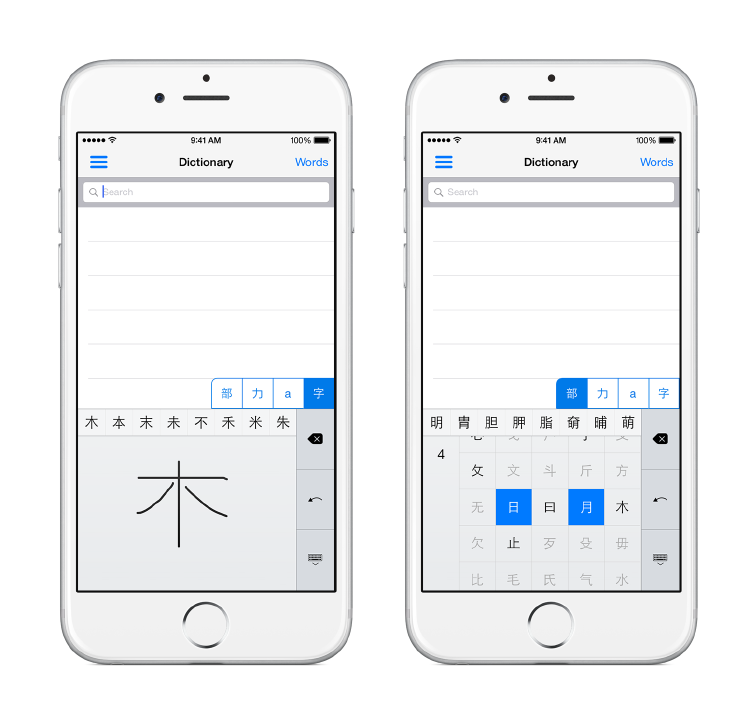 Keyboard can recognize both kanji and hiragana on a single tab, and separately katakana. 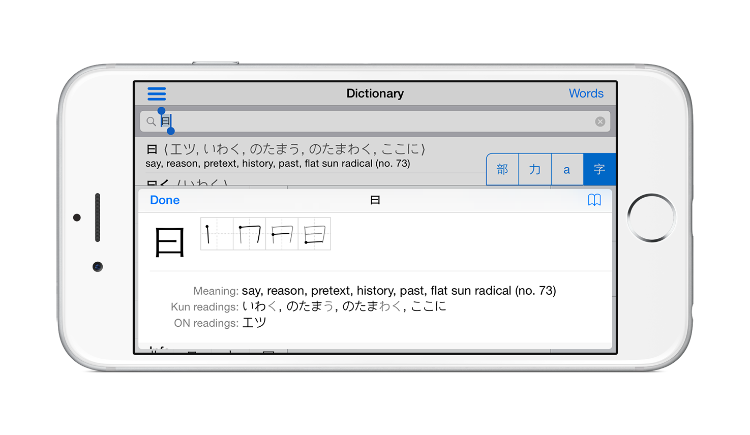 It's possible to input character variations such as え and ぇ.
Multi-radical search allows you to search kanji by its components. Found characters are ordered by growing number of strokes. If app finds multiple similar characters, you don't need to try them and redo drawing/selecting radicals each time. Just press longer on one of the result and get both search after adding that character and its description. After that you can simply replace it with another result or confirm it by clicking on the result once again. 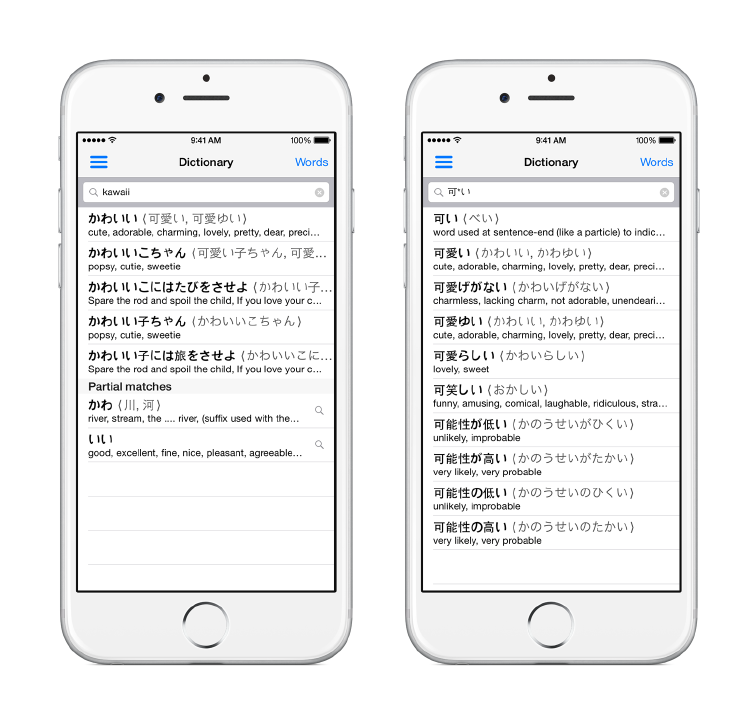 Just write English transcription on Japanese word and app will still find it. Romaji, hiragana and katakana are interchangeable, so you can simply write the easiest for you. It's also possible to mix them. You an use * instead of any number of character and ? instead on a ingle character. 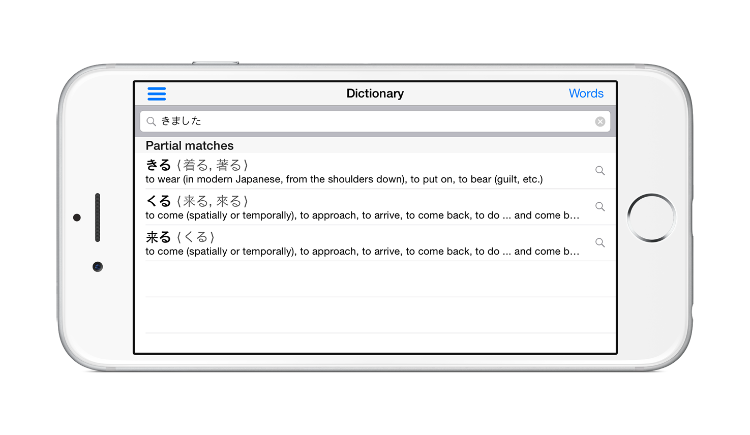 If you run across illegible character, this will allow you to still find the word you are looking for. Works both with English and Japanese words and names. 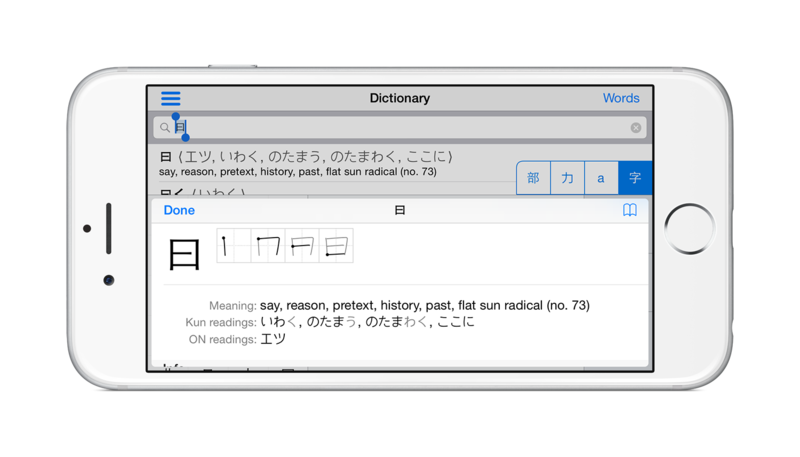 App allows to search for conjugated words, for example entering きました will still find the base words, such as 来る and 着る. 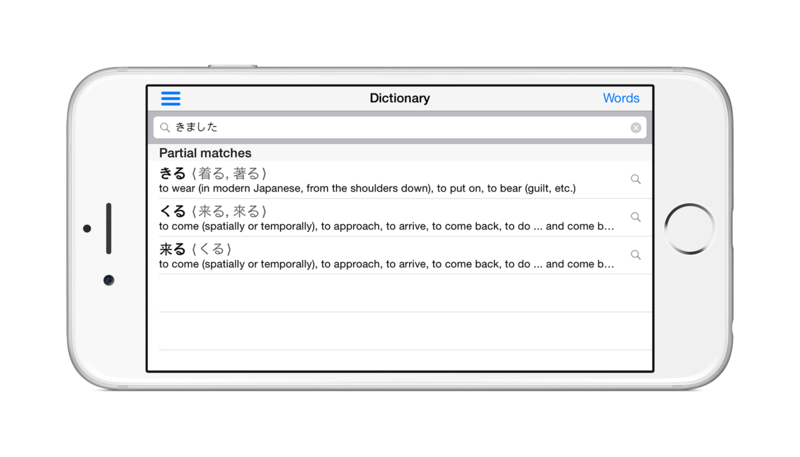 If entered text consist of multiple words or is a sentence, app still might be able to give correct results. KanjiVG (copyright © 2009-2015 Ulrich Apel) for displaying and recognizing characters in accordance with project licence located here." Kradfile-u (Copyright 2001 / 2007 / 2009: Michael Raine, Jim Breen, The EDR&D Group at Monash University, Jim Rose, The KanjiCafe.com) for multiple radical search under licence located here. http://www.tanos.co.uk/jlpt/ resources for providing word lists under licence located here. Apple, the Apple logo, iPhone, iPad, and iPod touch are trademarks of Apple Inc., registered in the U.S. and other countries. App Store is a service markof Apple Inc. Copyright © 2015 Błażej Stanek. All rights reserved.